The wild vagaries of the heart unite the four works on this disparate first half, which runs without a break. But my woman and I know what we’re for. 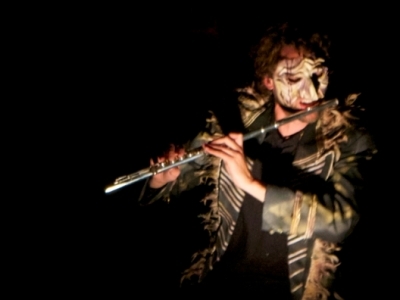 Colombine’s Paradise Theatre (2010-2013) is a musical fantasy on a 17th-century form of Italian theater known as commedia dell’arte and includes well-known characters from that art form – Colombine, Harlequin, and Pierrot. Although those characters are an essential part of the work, the piece has its own language and logic, and it is not necessary to know the commedia tradition to follow Colombine’s Paradise Theatre. One way to think of this work is as a “storybook poem” – “storybook” because of its linear structure, colorful characters, and use of imagery; and “poem” because of its associative and multifaceted relationship to meaning. In other words, information about individual characters as well as the relationships between them are reinforced on many levels. Colombine’s Paradise Theatre presents a series of eleven scenes that form a whole: Colombine is caught in a haunted repetitive loop and is lingering in a world between death and life. As she struggles to find her way, she is torn between contrasting forces that orbit around her – the narcissistic Harlequin aims to possess her while the benevolent Pierrot tries repeatedly to send her a message of truth. There is a kind of narrator throughout, the Harbinger – he serves as a guide as well as a witness to Colombine’s struggle. The essential elements of commedia are these: it uses stock characters (masked and unmasked) that have exaggerated, archetypal qualities; it is extremely physical and virtuosic; and much of it is improvised. These elements resonate deeply with me in the following ways: First, character is what compels me; I love to create sound worlds that reflect specific characters and their struggles. Next, I often compose music that asks instrumentalists to simultaneously vocalize and play. There are two important consequences to this: the music is deeply tied to breath and also to the body – which makes it virtuosic not in the number of notes that are played, but in what is physically required of the performer to render it effectively. Breath and movement indeed inform every aspect of this piece. Finally, like the commedia, Colombine’s Paradise Theatre often has an improvisational sounding quality, though it is all carefully notated and structured. This is an ensemble of world-class musicians that memorizes new music, that likes to express musical ideas by incorporating movement, and one that is made up of individuals who each embody a spirit of fearlessness. When I first heard them perform about ten years ago, a seed of possibility was planted. The result is this new work. eighth blackbird’s musicianship and experimentation caused me to want to dig deep and go to unknown places – to seriously stretch myself as a composer. To me, there is no other way to walk through the dark than with the light of possibility – light that, in this case, a flock of blackbirds helped me find. Colombine’s Paradise Theatre would not exist if not for the inspiring and creative partner I found in Mark DeChiazza – a collaborator whose ability to delight in the questions enabled all of us to push beyond what we thought was possible. Also many thanks to pianists Paul Kerekes and Daniel Schlosberg for their help with the development of snare.